High quality work affordable pricing! Call me today! Free estimates! Want to connect with Aaron? Friendly self employed family man. I do high quality work for affordable pricing. I don’t believe in cutting corners and take pride in my work. I tend to be a perfectionist because I like to give my customers the best of my work. 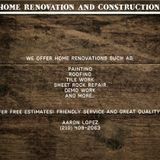 I offer services such as painting, sheetrock repair, tile work, roofing, demo, and more. I look forward to making your visions come true.